There is a very special place in my heart for bookbinding. I discovered the books of Keith Smith, particularly the Structure of the Visual Book, when I was in the Media Arts program at Ryerson. After that, every single one of my assignments for school became an experiment in bookbinding. When I moved to New York, I took many classes at the Centre for Book Arts. While I can say that I’ve made leather-bound library-style books, I can’t say that I’ve done coptic binding. But, I sure wish I could. Coptic binding is just one of the many reasons I admire Nightjar Books. Amy Borkwood, the one-woman show behind this bookbinding enterprise incorporates sketches, collages, woolen sleeves and stitchery into her works of art. I don’t think I could dream up prettier hand-bound books. 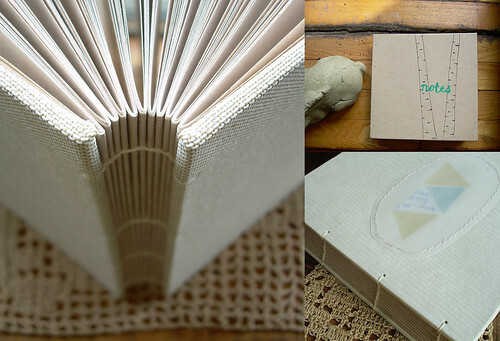 How did you get into bookbinding? Amy: I have always had an overwhelming interest in books – reading, writing, etc – and when I was about twenty, I found some books on bookbinding at the library and became fixated. I started making handbound books to sell at sales with some friends (Stitch ‘n’ Kitsch, a Waterloo-based craft collective) and my love of bookbinding has only grown since then. Your work incorporates stitching and textiles – do you also sew with fabric alone, or is your sewing primarily paper based? Amy: I really love textile art and I’ve made and altered clothing, but I don’t really work with fabric alone. I just can’t get involved in it the same way I can when working with paper. I love sewing paper, I love adding fabric and vellum, and I love working with different paper textures. What inspires your new designs? I really love the vellum collage journals. Amy: Thanks! I work at drawings in my sketchbook, and when I find something I like I either cut it up, or draw it onto thick vellum, and sew it onto the paper or bookcloth, which becomes the cover of a new book. I was using my Gocco a lot before I discovered how wonderful drawings on vellum look when they’re sewn directly to the surface of the book. 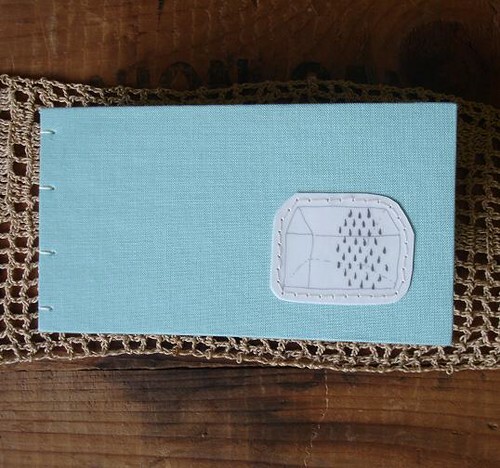 I still use my Gocco a bit, but I’m not as attached to it for every book design. Any new projects or directions you’re thinking of going in? Amy: I’ve been making lots of new sewn texture-collages, I guess they could be called. I really just spend most of my time sitting with a sketchbook and looking through scraps of paper and fabric, seeing what happens. You can find a fine selection of Nightjar Books on etsy. Nightjar Books will be at the Good Catch Double Dutch Craft Show at the Good Catch General Store, 1556 Queen Street West on Sunday August 17, 2008 from noon – 5pm. Yes, that’s the SAME day as the Kids Trunk Show at the workroom. That’s way too much fun for one day! I’m engineer but my life is craft. In Chile i took two classes with a lady who learn bookbiding on Barcelona, he teach me a lot, for her knew Keith Smith, and i have his ”Non adhesive books…” and love it. My books are still in learningare not great yet, but i hope will be great in a future.